Join in on the celebrations at Poppy's Coronoation Pod! Play with Poppy, the heroic leader in DreamWorks Trolls who lifts the spirits of everyone around her. With a song in your heart, you can do anything! 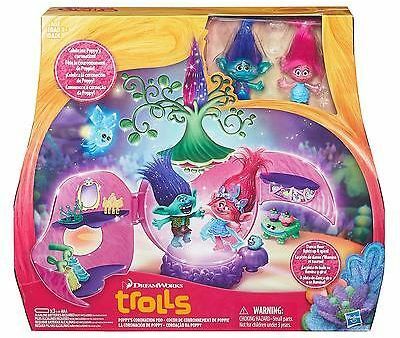 Poppy and Branch can show off their moves on the magical dance floor that lights up and spins! It also comes with two glamorous outfits so you can choose what Poppy can wear to her coronation and 11 accessories fit for a princess' party! From the creators of Shrek comes DreamWorks Animation’s Trolls, a smart, funny and irreverent comedy about the search for happiness, and just how far some will go to get it. This hilarious film transports audiences to a colourful, wondrous world populated by the overly optimistic Trolls, who have a constant dance in their step and a song on their lips, and the comically pessimistic Bergens, who are only happy when they have trolls in their stomachs.